As of version 2.2.0 of the M1 Touch Pro app, the app will now require a minimum of Android 4.1.x (Jelly Bean) or above to get the app. Devices running older Android Operating systems will not get any new update versions of the M1 Touch Pro app. Version 2.1.7 of the app will be the last update for older Android devices unless you update the Android Operating system. This change was made due to a new requirement by Google. Google has updated it’s Google Play Services SDK and requires later versions of Android in order to use the updated SDK. The M1 Touch Pro app relies on the Google Play Services SDK to make connection to your panel. 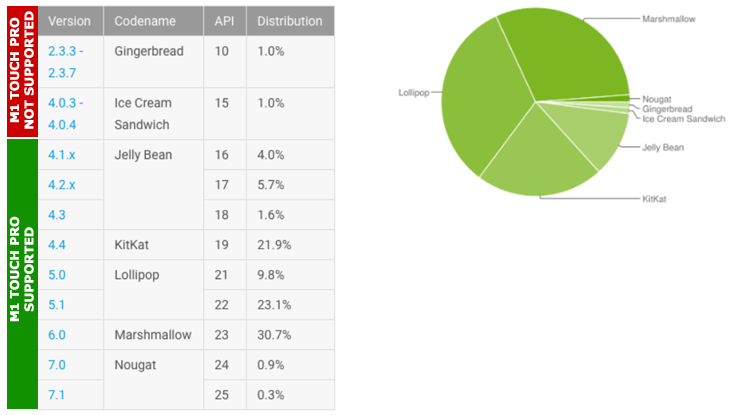 Most devices these days (as of February 2017) are running a higher Android operating system than what is required, therefore they will not be effected.